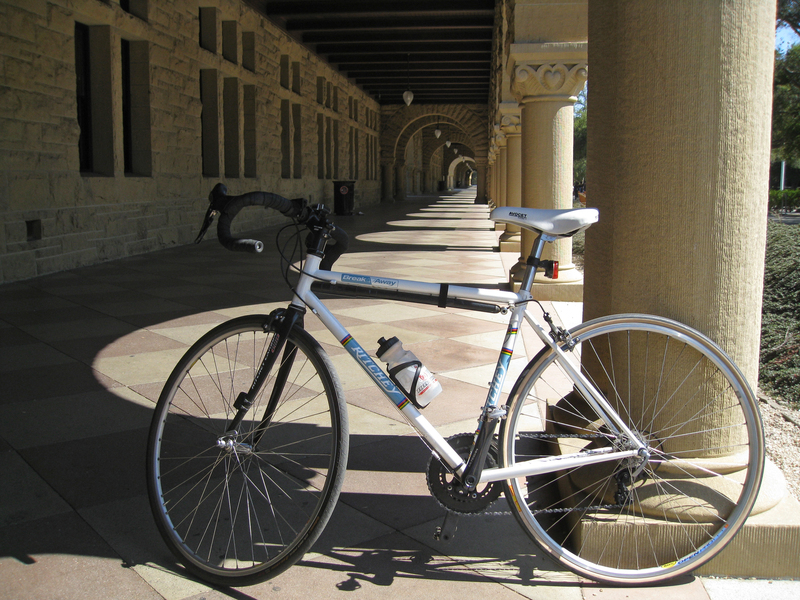 Stanford University’s original campus buildings have distinctive arched columns. While visiting Jobst Brandt I noticed his bike has some of the same components as mine — an Avocet Racing II saddle, a Continental front tire and an Avocet Road 30 rear tire. I guess it’s not all that unusual though. On my way home through the Stanford University campus I took Frenchman’s Road to Junipero Serra Blvd., a favorite road taken by Jobst over the decades (he graduated from Stanford). At the end of the road there’s a nice curb ramp to a small strip of pavement linking Junipero Serra. The way Jobst tells the story of the ramp, he had enough of curb jumping in the 1980s and wrote a letter to the powers that be asking for just a small amount of pavement. After a lot of foot-dragging the ramp finally went in. We are forever thankful for this small but meaningful cycling convenience. 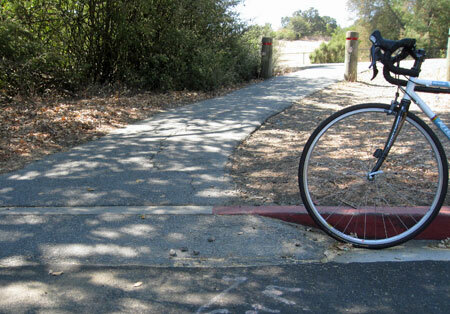 Frenchman’s Road ramp is one of those little conveniences that makes the cyclist’s life a whole lot better. This entry was posted on July 15, 2012 at 3:01 pm and is filed under News. You can follow any responses to this entry through the RSS 2.0 feed. You can leave a response, or trackback from your own site.